NOTE: Due to other needs for my instrument and the obvious lack of radiation in the air, I am thinking to stop updating this page. Based on the logs 1, 2 , 3 and processed data from my GAMMA-SCOUT® I have preapred the graph below. It will be updated from time to time (in the morning and in the evening?). The device was on my balcony on the 3rd floor, Tokyo-to, Minato-ku, Mita 3-7-31 until 2010-03-23 18:15. After that I moved it inside next to a window due to bad weather. At the moment the audio alarm for instant doses over 1.0 µSv/h is on, so I should be able to hear it. The measured values are average per hour or per 10min, in µSv/h (micro Sieverts per hour). 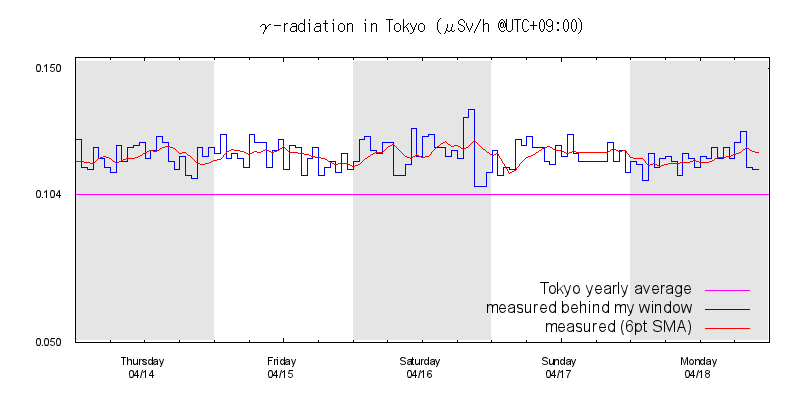 The normal average value for Tokyo is about 0.104 µSv/h. You can also see all the data so far. All photographs unless otherwise indicated are copyright© 1990-2011 Kalin KOZHUHAROV.